Two important gathering of MFTs occurred last month. ACU faculty participated in the TAMFT Leadership Retreat as well as the AAMFT Annual Conference held in Atlanta, Georgia where students also attended. Dr. Jaime Goff and Dr. Sara Blakeslee participated in the TAMFT leadership retreat in September where they joined executive leadership and committee chairs in a weekend focused on trends of the profession and needs of Marriage and Family Therapists in Texas. Included in this was also planning for the annual TAMFT conference which will occur March 3-5, 2011 in Austin. Dr. Goff serves as a co-chair for the Marriage and Family Therapy Educational Committee. She and Dr. Blakeslee are involved in the publication of the MFT national exam prep manual, so part of the weekend was spent planning exam prep courses and discussing updates to the manual. Although Dr. Blakeslee is not a committee chair, she enjoys giving back to the association through her involvement with the exam prep manual, and as a member of both the ethics committee and the conference committee. She feels that it is especially important for her to be involved as a younger member in the profession and as a faculty member at an accredited graduate program. Dr. Goff cites three reasons why it is important for her to be involved at the professional level. First, the collective strength of the professional organization provides support for individual practitioners. For example, the current suit by the Texas Medical Association against the Texas State Board of Examiners for Marriage and Family Therapist could have a widespread impact on the way that LMFTs practice and receive payment. TAMFT is working to protect licensed Marriage and Family Therapists. Dr. Goff also sees her participation in the professional organization as a way to bring a Christian voice to TAMFT. Despite recent withdrawal of Christian participats, Dr. Goff encourages Christians become more involved, especially in leadership positions. TAMFT serves its members, so being a part of it gives the Christian professional a way to make their voice heard. Finally, Dr. Goff’s involvement brings recognition and respect for the ACU MFT program. ACU faculty service at the professional level creates a reputation of excellence which ultimately benefits students and graduates by creating future connections. In addition to the leadership retreat, the ACU faculty members also attended the AAMFT National Conference. 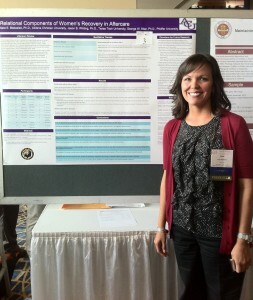 Dr. Blakeslee presented a poster on a subset of her dissertation titled, “Relational Components of Women’s Recovery in Aftercare.”﻿﻿ Qualitative interviews revealed that from an attachment perspective, women in the criminal justice system view their probation officers as a secure base from which they launch into recovery. Her research generated a lot of interest at the conference and received an overall positive response including advise other experienced professionals on how she can publish the research. Faculty were not the only ones to attend the AAMFT Annual Conference. Two second year students, Blake Berryhill and Tyson Alexander, were present. Both students used the conference as an opportunity to peruse the many doctoral programs represented from around the nation. Students were impressed by the quality of the conference presenters which included John Gottman, noted researcher on marital relationships and author of The Marriage Clinic. The 2011 AAMFT Annual Conference will be a little closer to home in Fort Worth which will hopefully allow many more students and graduates to participate in this important professional event.